Fangirl’s Guide to the Galaxy, by Sam Maggs (book review) – cosplay, conventions, geek girl heaven! Fanfic – yea or nay? Fangirls of the world, unite! Stake your claim in the imagined/future/fictional universe of your choice, and find friends online and in-person to share the fun. Happy book birthday to The Fangirl’s Guide to the Galaxy! Which fanship(s) do you identify with most? 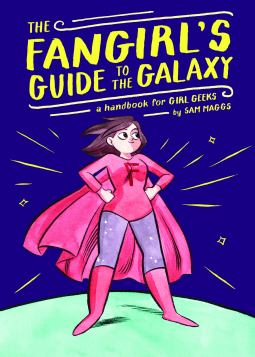 Book info: The Fangirl’s Guide to the Galaxy: a Handbook for Girl Geeks / Sam Maggs. Quirk Books, 2015. 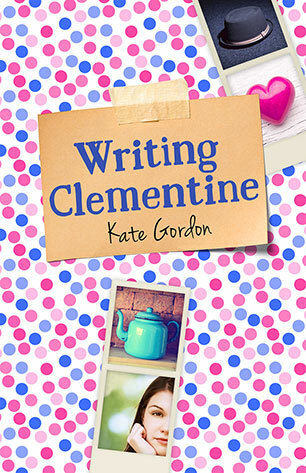 [author tumblr] [publisher site] [book trailer] Review copy and cover image courtesy of the publisher. My book talk: Geeking out about your favorite sci-fi series or superhero comics is even more fun when you get together with other fangirls – online or in person. But where to begin? Whether it’s gaming or anime, sci-fi or fantasy, Star Trek or Star Wars, you can find other fangirls who share your enthusiasms. Check out all the interviews with women writers and artists who share their advice on living the geek girl life (yep, many began by writing fanfic and drawing fanart). From staying safe, hydrated and blister-free at conventions to locating online fangirl communities and staying clear of trolls, Sam Maggs tells you all the hows, wheres, and whens in this super guide. Busting myths about feminism, girl gamers, and cosplay etiquette? Indeed! Helping others be proud of the stories and characters they love? Awesome! Discovering new female characters in comics, video, games, and books? The best! but did she know that his fighting lessons might save them all? The sugarplum fairy in this retelling of The Nutcracker tale uses her sweetness to conquer humankind, addicting them to her voice, stealing a kingdom and poisoning the land – and a mere human girl could be her undoing? Ha! From iron mechanical bugs which constantly rebuild the city based on Anise’s dreams to the wizards who’ve barricaded themselves in an impassible forest rather than take any risks, Clare has many challenges as she fights with once-statue-imprisoned Nicholas to free the people of Cane and regain his kingdom. Fairy tale retellings – which is your favorite? 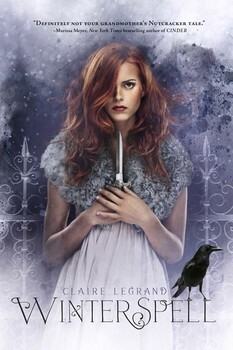 Book info: Winterspell / Claire Legrand. Simon Schuster Books for Young Readers, 2014. [author site] [publisher site] Review copy and cover image courtesy of the publisher. My book talk: Desperate to save her kidnapped father, sixteen year old Clara rushes through a door between worlds, right into a war between iron-wielding fairies and the land’s magical nature – and she could be the deciding factor! Since her mother’s mysterious death, Clara’s father has allowed organized crime to run the city. The young woman finds safety in Godfather’s workshop of wonders, whispering her worries to the statue there, as she always has. When the mayor’s home is attacked by supernatural beings, the statue comes to life and Godfather’s inventions fight back, but cannot prevent the kidnapping of Clara’s father. Clara, Godfather and former statue Nicholas leap into the kingdom of Cane, where time passes more quickly than in New York – and where the evil fairy Anise has enslaved the human population. Of Metal and Wishes, by Sarah Fine (book review) – ghost in the machine? Wen never thought she could find love within the horrific factory complex where her educated father is compelled to run a clinic, but now her heart is torn between two who demand her loyalty and affection. This adventure-romance set in an alternative perhaps-China echoes themes found in Phantom of the Opera with a steampunk twist and will be followed by Of Dreams and Rust in August 2015. Would you trust your very life to a whispered promise? 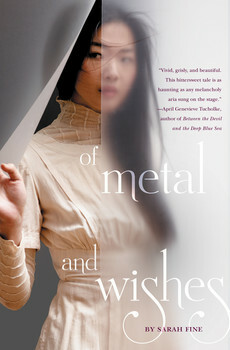 Book info: Of Metal and Wishes / Sarah Fine. Margaret McElderry Books, 2014. [author site] [publisher site] Review copy and cover image courtesy of the publisher. My book talk: In the slaughterhouse, Wen and her father fight ever-present death at his medical clinic, but an omnipresent ghost bent on revenge may tip the scales forever. Migrant workers in the slaughterhouse’s guts, machinists in its metalwork shops, her own educated father – no one can get out of debt to the company, yet the 16 year old tries to find a way, not relying on the gossips’ claim of a ‘ghost’ in the factory who grants wishes. When her murmured plea for an offensive worker to leave her alone results in a terrible accident, Wen realizes that there is something or someone with eyes and ears everywhere in the factory. When she begins helping the migrant workers whose underground leader Melik talks of overthrowing the bosses, the Ghost’s whispered promises to keep her safe from all harm become shackles instead of security. Calm future shattered for this princess. Riese doesn’t relish the tedium of running her kingdom some day, but she didn’t wish to become a fugitive with a price on her nearly 16-year-old head either. All because of a kiss? Whether you’re already a fan of the Syfy.com series (all 10 webisodes free here) or new to the world of Eleysia, this steampunk-slash-fantasy is a journey into adventure you don’t want to miss. And who wouldn’t want to have a telepathic wolf fighting on their side? Read chapter 1 here free. 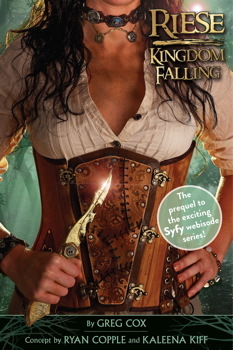 Book info: Riese: Kingdom Falling / Greg Cox; concept by Ryan Copple and Kaleena Kiff. Simon & Schuster Books for Young Readers, 2012. [author site] [publisher site] Review copy and cover image courtesy of the publisher. My book talk: On the run, Riese and her wolf try to save her royal family and kingdom from a strange mechanical cult bent on world conquest. Meeting a young artist while away from the palace in servant guise is thrilling for Riese, who dreads becoming Crown Princess soon and losing her freedom to ride and explore. His intentions toward her are honorable; toward her kingdom…no. Intricate clockwork gifts presented to the royal family by the Sect cannot hide the grumbling of kingdoms destabilized by the harsh goddess’s followers, and soon Eleysia’s borders are threatened. Will the mind-bond between Riese and wolf cub Fenrir endure? Can Riese convince the Queen that alliance with the Sect is folly? Will the King allow his warrior-daughter to fight alongside him? Ancestral tradition battles malign technology in Riese: Kingdom Falling, an action-packed adventure as well as a prequel to the Syfy web video series.